The 4th of July is just around the corner (HOW did it get so close?!) and we know that feasting celebrations are one of your favorite traditions during the holiday (ours too!). As much fun as it can be to indulge with your family and friends, overeating on holidays is a real thing and something we all want to try and avoid. Even if you run your local 5k that morning or participate in our 10am community WOD, that doesn’t mean you get to stuff yo’ face with whatever you want. Whether you’re hosting or just bringing a dish, consider swapping some of these fan favorites for their lighter, just as flavorful options. Some of the recipes have the nutrition facts already calculated for you for easy tracking! Skip the mayo and try a trendier version. Use sweet potatoes, like this recipe from Paleomg, or keep it simple with traditional red potatoes and tons of herb-y flavor. Find a recipe here. Classic burgers are fattier, normally made with 80/20 meat, cheese, ketchup, lettuce, tomato, mustard and a white burger bun. Choose a leaner beef (90/10 or higher) or even a leaner meat option all together (ground turkey, ground chicken, or a lean ground pork). Season and skip the cheese. Pesto, tomato, pickles, grilled veggies make fantastic toppings. Use a whole wheat bun or a bed of lettuce, pull the insides of the bun out (hollow it out) to make more room for toppings and less room for carbs! Check out this chicken avocado burger recipe from Laughing Spatula! Need to cut the fat? Use less avocado! Substitute with store bought Chicken Sausages, like these Chicken Apple Sausages we love from Walmart. Make it your classic way (we like grilled or boiled), just go easy on the butter and salt. Or, skip them all together and savor the naturally sweet flavor. Just say no! Pour yourself a virgin version or avoid the carbs and sugar all together and stick to good ole’ water. But, if you must, consider substituting sodas and sugary mixes with seltzer water, flavored or unflavored, and using natural/fresh fruit instead of the fruit concentrate or juices. If you really want to take the brain work out of it, there are a few companies selling spiked seltzer water by the can now. Take a look at this taste-test review of a few different brands if you’re looking to mix it up! Most are very low in carbohydrates, sugar, and you can find plenty of brands that are gluten free. Try a recipe that uses a vinegar or olive oil base instead of mayo, for a healthy fat or no-fat option. Check out this olive oil-based recipe. Try this recipe and substitute Greek yogurt for mayonnaise. Trust us, it’s good. Cobbler or Crumble (less crust!) Try this low carb, rhubarb option. If you’re not a rhubarb fan or don’t have any on hand, sub any type of fruit you like! The classic white cake with vanilla frosting, blueberries and strawberries to create an edible American flag. Cute, yes. Healthy… not so much. Get the same kind of patriotic vibes with these Banana Split Kebabs! 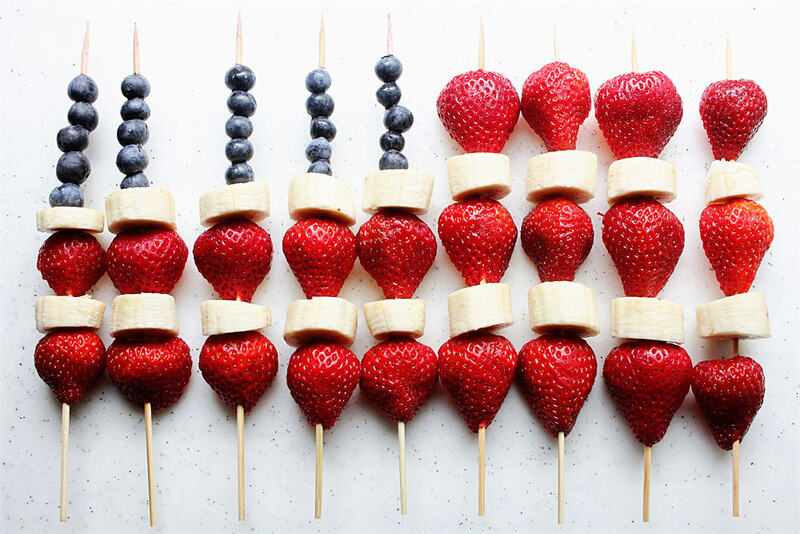 Skewer a piece of banana, blueberries, and a strawberry onto a kebab stick in alternating red, white, and blue order or organize to make them look like a flag. Dip them in whipped cream or drizzle chocolate on top for an extra dessert kick. Feel free to use any combination of blue, white, and red fruits you enjoy eating! Don’t forget our BRFC community WOD at 10:00 on July 4th! Bring your friends and family to the gym and we’ll all sweat together before the cookouts and fireworks begin!